In the construction industry, extra steps are taken and continually refined to ensure that the end result is the safest and most structurally sound. One aspect of building design, fabrication, and erection that can be the hardest to account for is the myriad of possible defects. From the initial design to the final bolting, every element in the construction process must be completed to perfection to avoid any costly problems later on. Builders across the Great Lakes area rely on high-quality structural steel services to mitigate the risks, and Sanilac Steel is here to help. Our structural steel fabricators in Michigan have been at work for more than 50 years, and we’ve seen it all. Sanilac Steel relies on the best training to ensure safe, reliable outcomes for every structure, and we’re dedicated to seeing your project through to the end. 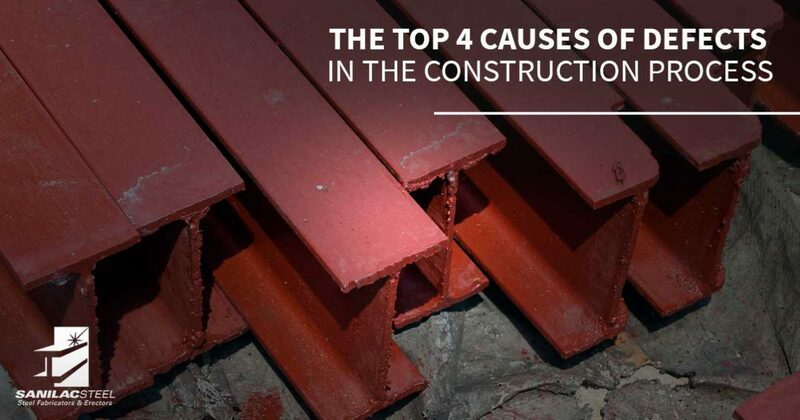 Today, we’ll discuss the top four defects known in the construction process, as well as the value that our structural steel providers bring to the jobsite. The quality of your steel structure design is essential for completing a building that is safe for its intended lifespan. If your project does not constitute proper engineering and design practices, defects are likely to develop. It essential to rely on engineers and architects who have the expertise and experience to provide plans that accurately represent the loads and stressors of the intended building. From the initial consultation to design calculations to steel details and more, every element of this initial stage must be performed perfectly. Beyond the design phase, it is important that your plans account for conditions that may not have been considered at the beginning. Contractors are tasked with inputting submittals and shop drawings to make changes to the initial plans, and these changes need to be accounted for properly to ensure the final result still meets design minimums. In order to achieve the highest level of quality for your building, you will need to determine the full scope of specifications to account for every aspect needed in construction. Steel structure design accounts for the physical requirements, yet steel erection and the full building completion will need additional elements to determine the full range of needs. Prescriptive specifications consist of the complete design plans, giving builders and clients more certainty about their final product. Performance specifications consist of designs that still need to be completed, giving builders more room to innovate as the project develops. If your building relies on complex elements to perform a function that exists outside the normal scope of design, it is important to leave room for adaptation and improvement. In other cases, simple buildings with proven designs may suffer from defects if changes are enacted that are not found to be stable. Unfortunately for many builders, material defects are often not discovered until after construction is complete. Once a material is installed, it is expected to perform exactly to its design specifications. When it comes to vital elements such as structural steel, extra measures will need to be taken to ensure that the materials are perfectly suitable for use in load-bearing building elements. Failure to do so can result in costly repairs and put building inhabitants at risk. Sanilac Steel specializes in structural steel fabrication across Michigan, and our experienced team works diligently to ensure that every product we deliver to the site is perfectly suited for the job. Our company undergoes rigorous training and inspections to meet standards at both the national and local levels. If all of your materials, specifications, and designs deployed perfectly, defects can still occur due to shortcomings with the craftsmanship. In most cases, this problem develops from builders and contractors not following the plans to perfection. Minor mistakes at any point in construction can lead to costly problems later on, making it vital for builders to rely on the most professional workers to ensure that every step is taken to avoid or rectify any problems during the construction process. From the foundations to the flashing, every part of your building will need to be checked to ensure no man-made errors occur. Our steel fabrication company excels in minimizing defects throughout the construction process, taking the time to check every aspect of our process to ensure that safety and integrity are upheld at all times. Our steel fabrication company strives to deliver the highest level of professionalism and quality at every stage of your project. From steel design to erection services, Sanilac Steel is proud to provide comprehensive results that minimize the risk of defects developing. Since 1967, our structural steel fabricators in Michigan have worked diligently to perfect our process. Contact us today to learn more about the value delivered by Sanilac Steel, and be sure to ask for your free estimate!